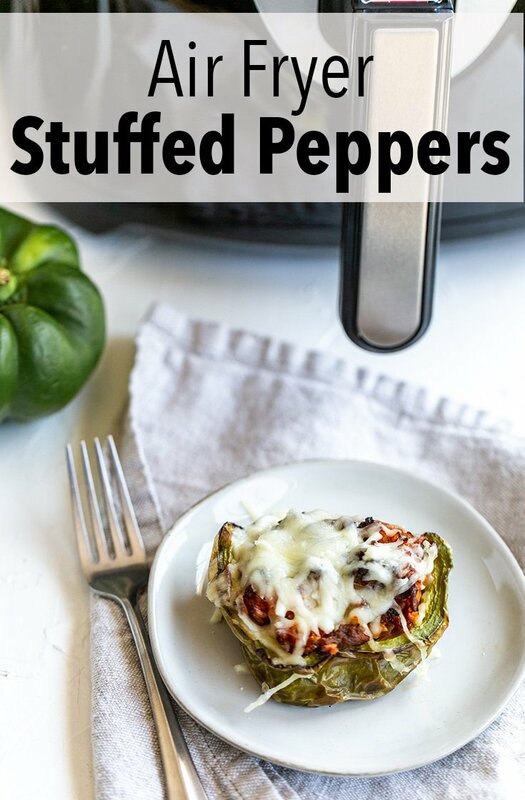 Conveniently make classic stuffed peppers with ground beef and rice in the air fryer. 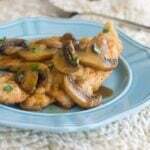 You won’t believe how fast they cook and how easy it is to do! 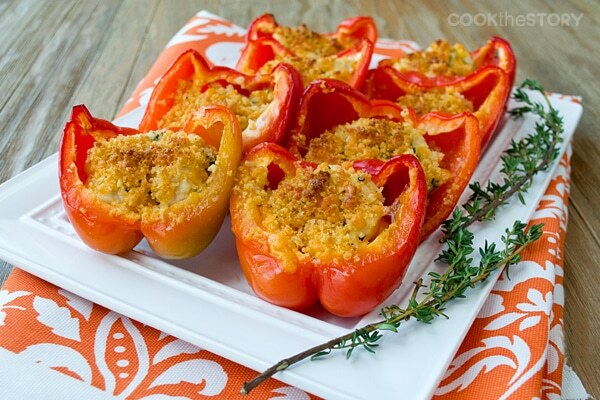 Stuffed peppers are one of my all-time favorite comfort food meals. I love that they’re so customizable, and you can put whatever you want inside! 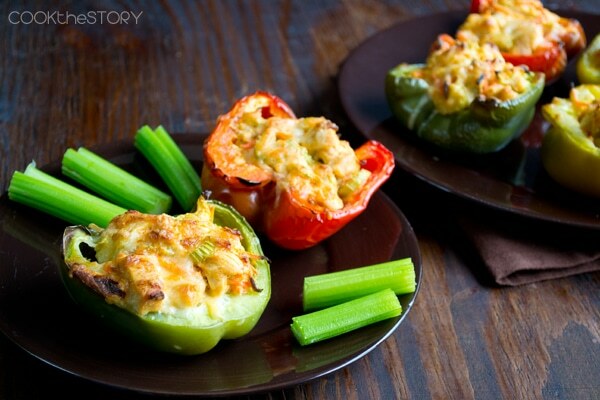 In fact, on my sister site, The Cookful, I have an entire series dedicated to stuffed peppers. I don’t think I could pick a favorite if I tried! 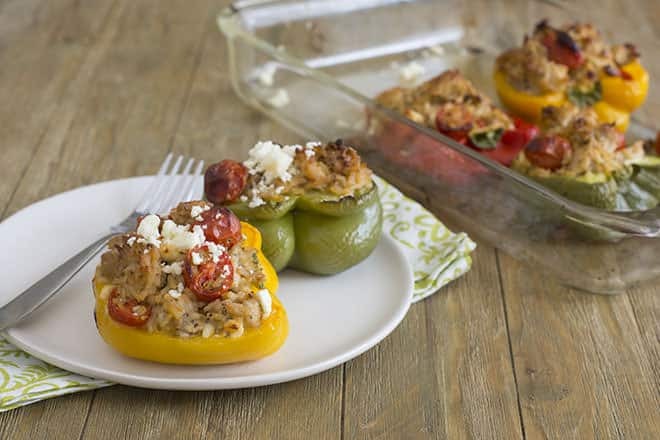 The only thing that is a drawback to stuffed peppers is how long they take to make. 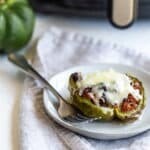 My Classic Stuffed Peppers take about 45 minutes to bake, which kind of puts them out of the weeknight category. I try to make things that take about 30 minutes or less on the weeknights to save time. Recently, I’ve found a way around that. And that’s the air fryer! 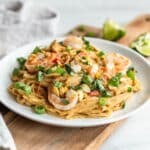 I’ve been loving my air fryer for just about everything the Instant Pot can’t do. I’ve even made seafood in it. 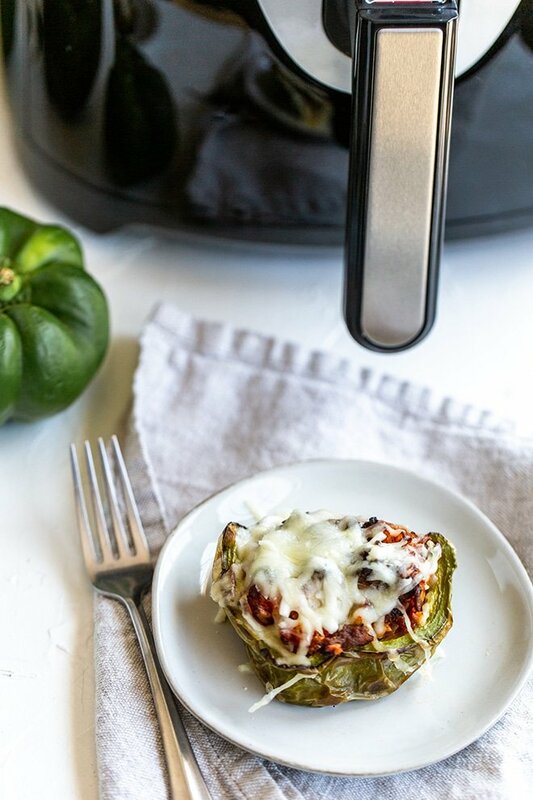 The air fryer is great because it uses hot air circulation to cook things really quickly, so the peppers get nice and soft, the filling sets and the cheese melts in half the time it takes to cook stuffed peppers in the oven. I do find that slicing the peppers in half really helps things, as well. This way, they aren’t as thick, and everything cooks really evenly. 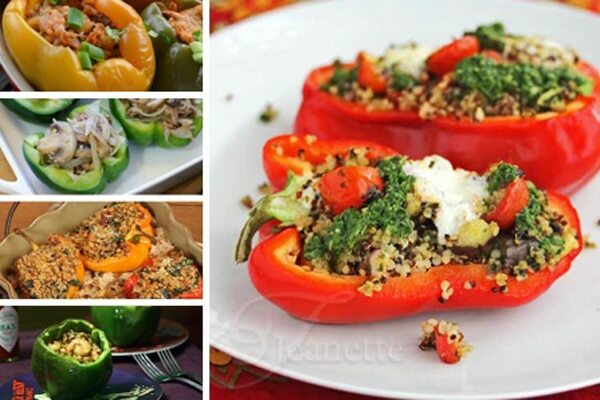 I love the way the skin roasts a little on the bell pepper, it adds an amazing flavor. You’ll assemble the beef and rice filling, stuff the pepper halves and slide the air fryer tray in. After they have cooked for 15 minutes, slide out the tray, top with cheese, and insert again to melt. 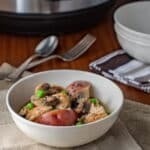 A perfect and easy dinner made for you in just about 30 minutes. Enjoy! Once hot, add the onion and saute for 5 minutes before adding the ground beef, salt, pepper, and garlic powder. Cook until the ground beef is browned, about 10 minutes, and then add the rice and tomato sauce. Place the pepper halves into the bottom of the air fryer tray. Fill each with the beef and rice mixture. Slide the tray into the air fryer, and set the temperature to 360F. After 15 minutes has passed, slide out the tray and sprinkle the cheese on top of the peppers. Slide the tray back in and let the cycle finish. Carefully remove the peppers and serve!